I bought this direct from VOAK while at the Oklahoma Vape Jam 2016. They offered me a taste of it after I said I liked the VOAK 1984. I think my exact words were "Mmmmmmmm gimme!" The 60 ml chubby unicorn cost me $20 at the show. At this time, I have not been able to find this available online, but I suspect, it will be between $25 and $30. The bottle came as just a bottle. Sigh... I think I was immediately spoiled by the VOAK 1984 packaging. It's just a chubby gorilla style unicorn bottle, very easy to use (but not so easy to open) with a wrap around label. The label, along with an easily identifiable coffee shop kind of logo and pictures of salted caramel cubes and roasted coffee beans, displays all the warnings required by California and the new FDA regs, the volume, and the nicotine strength. There is no mention of the PG/VG ratio. There is one additional cautionary statement not required by the regs at the bottom of the label, beneath the logo: "Careful, the e-juice you're about the enjoy is extremely amazing." I initially tasted this in an Aspire Clieto (I don't know what coil was installed), and I've dripped a little. The majority of the e-liquid has been vaped from The Tank by Scottua. That tank is built to .5 Ohms with a pair of fused Claptons. I've been rocking it at around 70 watts on my Sigelei Snow Wolf 218. 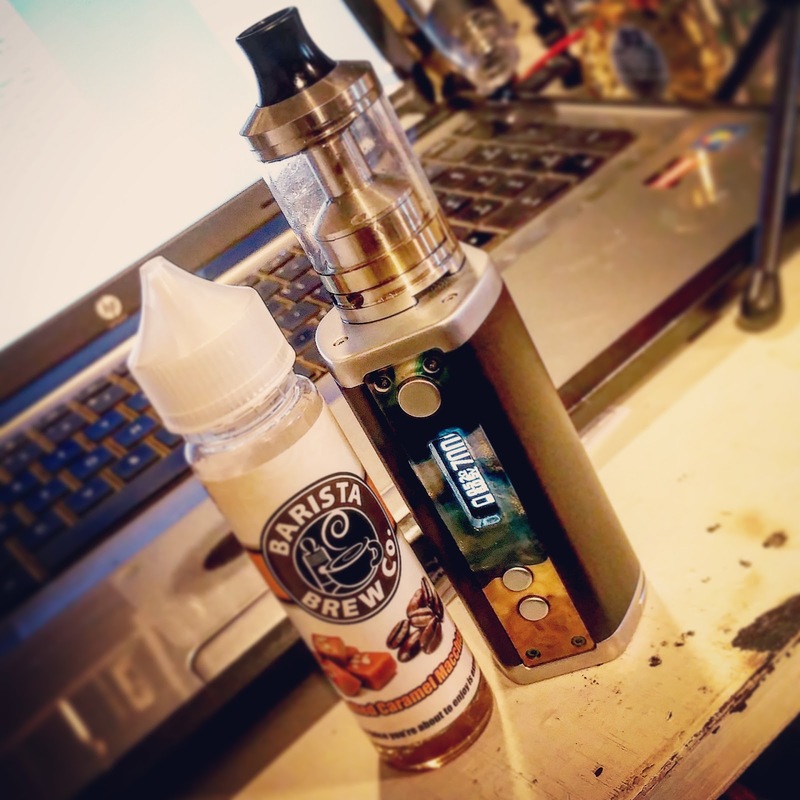 I could try to look up the flavor profile from some website, but with a name like Salted Caramel Macchiato from the Barista Brew Co., I think it's safe to say that this is a coffee beverage vape. However, making that simple statement does not do this e-liquid justice in any way, shape, or form. On the inhale, it's coffee and sweet cream with a hint of caramel. On the exhale, though... that's when the salted caramel kicks in. I can almost feel the salted caramel dripping down my throat. Pure yummy! The scent is very mild. Many coffee vapes I've tried have an almost offensive burnt coffee smell. The Wife says they smell mousy. This one just smells like a well run coffee shop. If you like coffee vapes... sweet, creamy, rich dessert beverage vapes... get this now! Even if that is not your normal flavor profile, I can still recommend this e-liquid as an occasional after dinner vape. There are just two cons; I had a heckuva time getting the bottle open as it was screwed on very tight and the child-proof tabs would not engage... they just slipped (I suppose one of the reasons I like it might have been because of the anticipation); The label does not have VG/PG ratios on it; The flavor is a little strong so if switching flavors a lot is a common practice, know that this one lingers (pleasantly IMO).